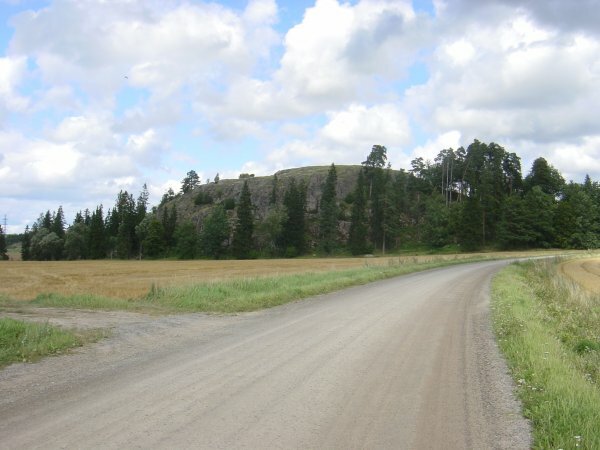 Notes: Old Castle of Lieto (Finnish: Liedon Vanhalinna) is a formerly fortified hill in Lieto, Finland. The original name of the castle is not known. According to excavations, the castle has been in use in the Late Bronze Age (1500-500 BCE), in Middle Iron Age (500-700 CE, contested) and in the Middle Ages up to the end of the 14th century, when it was replaced by the "new castle" in Turku harbour. It probably served as the first Swedish fortress in Finland from the mid-13th century onwards after the Second Swedish Crusade. Constructions on the hilltop were mostly of wood. In the latest phase, some bricks were used as well. The castle was located between two ancient transport routes: Aura river and "Oxen Way of Tavastia" (Hameen Harkatie) leading to central Tavastia. Its importance decreased when the Turku castle was finished in beginning of the 14th century. The steep hillside supported by wooden fortifications on top of the hill provided a good defensive position. Archaeological excavations have produced evidence of a 14th-century battle on the site.The area is currently owned by the University of Turku which received it as a donation in the 1950s by the previous owners, Mauno and Ester Wanhalinna (the last name Wanhalinna is old Finnish spelling for "old castle") who had decorated the place as a manor home. In accordance to the donation charter, Vanhalinna also houses a museum with archaeological finds on display on eras of Varsinais-Suomi, starting from Stone Ages. Folk cultural department shows agrarian tools and life.